Finding a mutually available time to meet with multiple busy people including clients, colleagues and other parties used to mean a lot of negotiation and multiple emails. Then tools like Doodle and FreeBusy came along to make scheduling much easier. 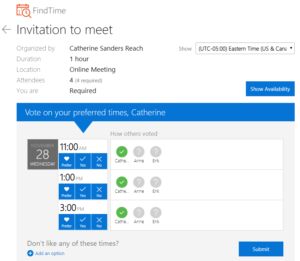 Now users of Microsoft Office 365 can take advantage of a built-in polling tool called FindTime that integrates directly in the Outlook calendar for free! FindTime is available from the Office 365 App Source and installs in your MS Outlook software. It will also appear in the browser version of Office 365 through Office.com. In MS Outlook you can invoke FindTime when you send a new meeting request from the calendar or add a poll to an email by clicking on “New Meeting Poll.” You can also add a poll when responding to an email by clicking “Reply with Meeting Poll” in the Ribbon. 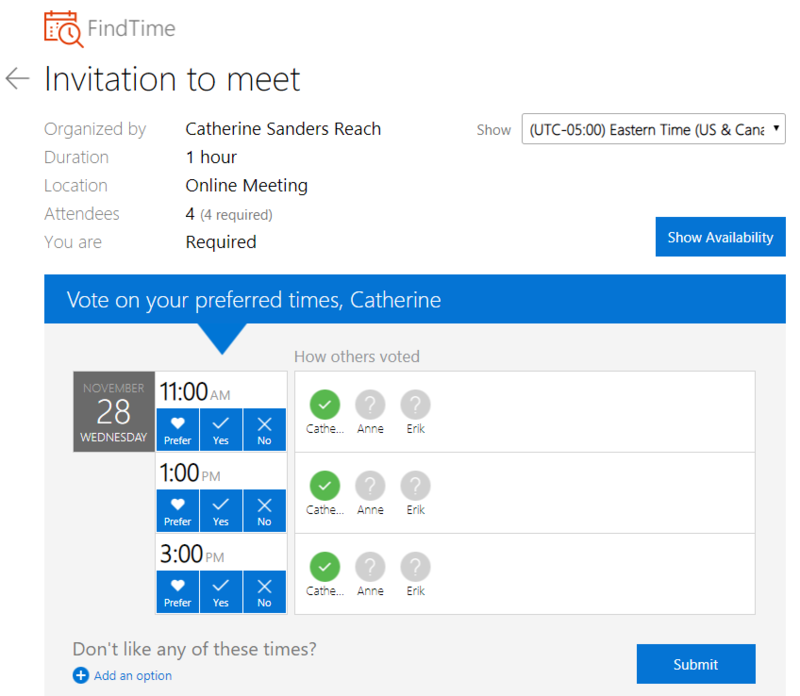 Once you click on the FindTime “New Meeting Poll,” a toolbar will appear on the right of the screen. If some of the meeting participants are in your firm, it will automatically show their availability from their Outlook calendar, as well as your available time. Then click on the times that work for you and your internal team. You can select multiple times on multiple days. FindTime will then create a poll which will be sent with the event request or email. Recipients of your request will click a link that takes them to the poll. They do not need to have MS Office 365 or FindTime, just access to a web browser. They can select their availability and even suggest other times, as well as other attendees for the meeting. FindTime will tally all the responses and once everyone responds, it will automatically finalize the event and send a meeting request. FindTime makes quick work of what has been a tedious process. Catherine Sanders Reach is director of the NCBA’s Center for Practice Management.